Creative thinking is a fundamental skill necessary for our survival on this planet. The performing folk arts in education can nurture this essential skill. At this point in time there has never been a more urgent need for an approach to education that prepares children to face the challenges of the twenty-first century. My vision for education and the role of the arts in education is grounded in global education, a holistic model established by Graham Pike and David Selby of the International Institute for Global Education. Their approach merges two vital strands of educational thinking that are interrelated and fundamental to education today: “childcentredness” and “worldmindedness.” Their model for global education is based on a holistic paradigm comprising four interactive dimensions: spatial, temporal, global, and the inner dimension — the human potential. 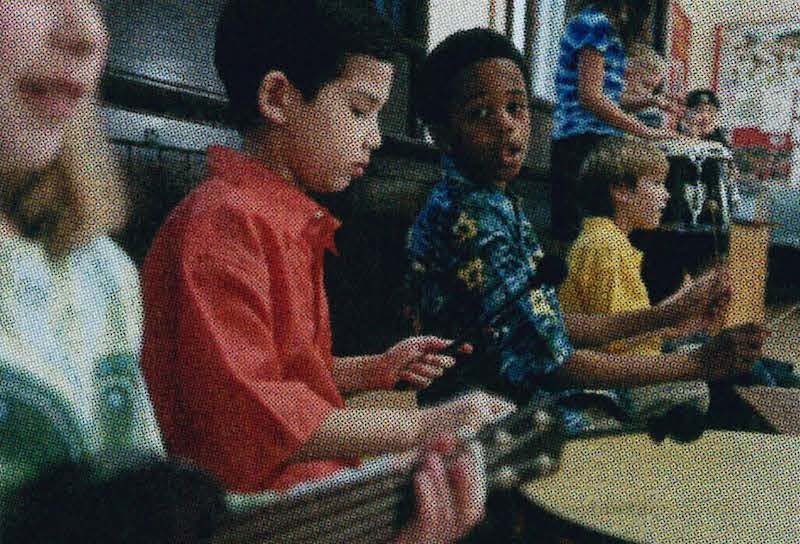 (Pike & Selby, 1998) In working with the performing arts at Mariposa in the Schools (MITS) I have witnessed the relationship and relevance today of a global education approach to the elementary curriculum through the performing folk arts. Why the performing folk arts? The performing folk arts emerge from common experiences of a community, linked by traditional beliefs, customs and stories. Through the art forms of music, storytelling, dance and theatre, they have been passed down through generations. Shared concerns, issues, events, beliefs and morals form the subject matter and provide a sense of continuity and belonging through time—past, present and future. Stories, for example, although created within a specific context, have relevance through time and across cultures. They pass on our common human experiences, collective histories, cultural traditions and collective wisdom. Social and political commentaries, through satire, allow for introspection and can potentially lead to social change. Often the subject of the art form transcends cultures through time, making the messages powerful and relevant today. Childcentredness is based on the belief that the best learning occurs when children are treated as individuals and encouraged to discover on their own. (Selby & Pike, 1998). By nature, the performing folk arts are highly participatory, like call-and-response in songs or changing partners in dance. Students are not just spectators but immediately engaged in the activity. They are accessible — anyone who wishes to participate can. No expertise or training is required to engage in the activities. The performer acts as facilitator for both students and teachers. Their goals are to empower the participants, by nurturing self-esteem, and provide vehicles for creative expression. Children also have opportunities for shared experiences, working together to create, learn, celebrate and make social commentary. Songwriting and storytelling, for example, provide a wealth of opportunities to support curriculum, while developing communication and listening skills. Award-winning MITS performer, musician, singer and songwriter, Kathy Reid-Naiman, specializes in working with young children. She has developed unique programs like "Singing Dances” and "Music and Movement” that actively engage students in a variety of activities of song and movement. “Once Upon a Farm” and “12 3 Mother Goose & Me” by storyteller Sally Jaeger address basic literacy and listening skills through stories, rhymes, songs and fingerplays. Similarly, Paul Gaulin’s workshop and performance “Learning to Speak Well” for older children uses mime as a vehicle to explore communication through body language. Jim MacMillan and Marcus both provide songwriting workshops that are not only excellent vehicles to develop communications skills and nurture individual creativity but also have great potential to support curriculum. Storytellers, like DanYashinsky and Itah Sadu, are also writers. Involving storytellers and writers in the classroom to enhance the curriculum at the Junior level can provide quality, alternative and enriching activities to support literacy initiatives for young children. Ken Whiteley’s “Simple Machines” and Deborah Dunleavy’s “Pulleys, Levers, and Gears —Oh My!” address components of the science curriculum through song and performance. Following a program, classroom teachers and students can continue to integrate the art form across the curriculum and into classroom activities. Worldmindedness nurtures a “tolerance and respect for people of other cultures, faiths, and worldviews” and “an understanding of global issues and trends.” Pike and Selby state that “worldmindedness is no longer a luxury, but a necessity for survival in the new millennium.” (Pike & Selby, 1998) The performing folk arts nurture respect, appreciation and understandings of other world cultures and perspectives. Students experience cultural traditions other than their own and recognize their relevance to their lives. For example, Jamaican-born Michael St. George brings the tradition of dub poetry — poetry with a purpose — into the classroom to effect positive social change. Children come to understand the legacy of popular trends, like hip-hop and reggae, and the African roots of this oral tradition. Likewise, Njacko Backo, from Cameroon, through music, dance and stories, draws parallels between community life and values in his native village in Africa and children’s lives in North America. Rita Cox, in “Stories from Around the World,” and Sandra Whiting, in “Tell Me a Story,” both share stories that reflect the diversity of voices in our communities today and demonstrate the universality of oral traditions. Black History (or African Heritage) Month presents challenges to educators who are uncomfortable or feel inadequate to addressing issues of racism and slavery. Although MITS supports the integration of African culture throughout the school year, we are nevertheless inundated with requests for our Black performers in February each year. A Black performer in the classroom who is an expert on these issues can relieve this discomfort, begin the process of celebrating diversity, and nurture an understanding of the significant contribution Black cultures have made to Canadian history and culture. Catalysts for change The content of the folk arts addresses our human experiences and sense of community. They can also be powerful vehicles to nurture essential life skills, address critical issues and be catalysts for learning more about ourselves and others. Future-oriented, they allow tro r perspecti.v e on our past acti.v.it. ies, allowing us to make choices about our future. Grassroots-based, they emerge from the shared experiences of communities and address concerns, issues, needs, joys, challenges and more. They are also a means of taking action on a critical situation. To cite some examples, the Community Builders, a collective of educators and performers, provides programs specifically designed to build community within schools and ensure a safe learning environment. Using music, drama, visual arts and activities they address issues of bullying, gender stereotyping and discrimination. The children are engaged in activities that help them understand these issues and to develop leadership skills. Students apply these new skills to take leadership roles in the school community. Another approach to taking action is demonstrated in the work of David Anderson, who specializes in street theatre. In his “Narrative Theatre” workshop, David introduces students to theatre techniques involving music and giant puppets as vehicles to address a theme or issue relevant to students’ lives. The result is that students discover and share alternative and creative means to express their concerns and points of view to their communities. Deborah Dunleavy’s“ Bullying” workshop addresses the affects of real problems, stemming from discrimination and racism, that manifest themselves in physical and verbal bullying. Through song, story and movement she initiates a process of how to recognize and handle such situations. Similarly “Hot Issues —Cool Solutions,” with Rita Dighent, Paul Gaulin and Naomi Tyrrell, presents examples of real situations resulting from peer pressure that students find themselves in and creates an awareness of good conscience when making decisions about challenging issues like drugs, violence and crime. “Co-operative Games” by performer and classroom teacher Jim MacMillan is designed to develop group skills and co-operative behaviour through noncompetitive games. Such programming can provide a catalyst for children to re-think how they see the world, the relevance to their lives, and a creative model for taking action. The performing folk arts in education can begin the process of nurturing what Selby and Pike call the “ inner dimension” — our human potential. “ If the heart is not engaged no significant change or transformation can take place” (Pike & Selby, 1998). The performing arts allow for a multi-varied approach to teaching that addresses multiple intelligences and diverse learning styles. Participatory, experiential, co-operative learning strategies, creative problem solving and hands-on activities are all characteristic of traditional-based and contemporary performing arts programming. If we are to prepare our children to meet the challenges of the twenty-first century, then we must provide the means and skills, building self-esteem and confidence to enable them to take action. Never before have we had a need to understand others, nurture co-operation and build community. About Mariposa in the Schools Mariposa in the Schools (MITS) was conceived over 30 years ago as a service through the Mariposa Folk Festival to bring traditional folk music into schools. Today MITS’ roster reflects the cultural diversity of our changing communities. Over 45 performers — musicians, storytellers, actors and dancers — provide over 150 different programs in schools and community venues. MITS is a registered, not-for-profit arts education organization that provides traditional-based and contemporary performing folk arts education programs in schools and community venues throughout Ontario. We specialize in performances and workshops. We encourage programming in workshop format — class size — that maximizes participation and provides sustainable activities for the classroom that are relevant across the curriculum. Education resources for classroom use to support programs and curriculum. Mariposa in the Schools is committed to the principal of equity of access. We believe that no school or community organization should be denied access to our programs due to financial constraints. Cutbacks in budgets have resulted in some schools being unable to access enrichment programs, particularly in inner-city schools or in more remote areas of the province, where the ability to raise funds is limited or non-existent. To address this situation, MITS seeks funding to support programming. For example, in the fall of 2001, MITS worked with the Toronto District School Board to provide programming for inner-city schools, particularly for those with students with special needs. Mariposa in the Schools operates with support from the Ontario Arts Council, the Ontario Trillium Foundation, the Toronto Arts Council, the Toronto Musicians’ Association through the Music Performance Trust Fund, and from the private sector through foundations and individuals from the community. Julie Stone, B.Ed, M.Ed (global education) is the Executive Director of Mariposa in the Schools. Prior to joining MITS, she was Department Head of Gallery Tours and School Programs for the Art Gallery of Ontario. Gardner, Graham. Frames of Mind: The Theory of Multiple Intelligences . New York: Basic Books. 1984. Graham Pike & David Selby. Global Teacher, Global Learner. Toronto: Hodder & Stoughton, 1998. For four minutes and 13 seconds, my classroom was silent. Although it was already February, this was the first time in the school year that my Grade 7/8 class had nothing to say. Speechless was a better way to describe it. What is a doll? If you were asked that question, visions of cherubic-faced porcelain dolls, G.I. Joe action figures or perhaps even the latest fad – Monster High dolls – would come to mind. What if someone asked you what an “art doll” was?